The past (almost) thirty years have seen Paradise Lost undertake one of the most interesting journeys in British metal. 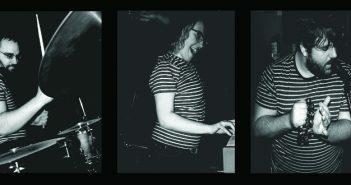 Since their debut album, Lost Paradise, the Yorkshire band have helped usher in death-doom, hit almost-mainstream success with Draconian Times, embraced synthpop – starting with the recently reissued One Second  – and then came back to almost where they began; the ten past ten years have seen them release some of their heaviest (and, in The Plague Within, some of their best) material. It’s this version of Paradise Lost that can be found on latest album Medusa, which at times sounds as if the songs could have been written around the same time as those on the genre-defining Gothic. Each one of these eight songs is undeniably heavy, but as would be expected from a Paradise Lost record, there’s plenty of melody to be found, whether it be in the leads and solos that rise up regularly, or in the riffs themselves. Vocalist Nick Holmes uses his range to great effect, and though most of his vocals are growled in a typical death metal style, his occasional use of clean vocals provides a great sense of contrast, making both techniques seem more effective than if used alone. Medusa is a relatively varied album for death-doom, meaning that even if the tone and sound is of soul-crushing despair and heaviness, Medusa moves with the kind of confidence that only experience can bring; but there are points where this variety can work against the album, in small but important ways. Some tracks quickly stand out or provide obvious routes through which to unlock Medusa. The opening track, ‘Fearless Sky’, is an irresistible slice of miserable, crawling death-doom, and its eight and a half minute duration gives it plenty of time to sink its claws in to the listener as it slowly evolves towards a glorious, emotional ending. The title track demonstrates how effective Nick Holmes’ gorgeous clean vocals can be, which he uses throughout most of the song, and at over six minutes, its slow riffs and movements are given ample time to show their power. It’s the most unusual track on Medusa, but also one of the most effective, and that the remaining seven stick quite closely to the death-doom template makes its differences to the rest of the album all the more striking. By contrast, ‘The Longest Winter’ is an immediate, hook-laden beast of a track, and an obvious choice of single ahead of the album’s release, with shades of almost every era of Paradise Lost in its sound – a catchy chorus, crushing doom riffs, and strong melodies that make the dark atmosphere of the song all the more effective. It is the highlight of the album, and is sure to become a new favourite live. Penultimate track ‘Blood and Chaos’ is also a clear choice for a single, with a strong melody, plenty of energy, and a concise duration that works in the song’s favour. The title track aside, there are no real departures from the typical death-doom sound or mindset – there’s nothing that changes course as drastically as the rocking ‘Cry Out’ did on The Plague Within. And even then, the title track isn’t a large shift away from death-doom – it’s a different way of approaching the style, rather than some grand change of direction. ‘No Passage for the Dead’ does feature an unusual, winding melody, but this only rises from the crawling, crushing riffs at select moments, so even if the melody is unusual, the song itself still feels close to the death-doom template. Interestingly, for an album made by such a veteran band, Medusa can feel like an album that is difficult to get a grasp on. This is not to say that it’s intentionally awkward, or goes off in to experimental territories as fellow Peaceville Three bands  have in recent times; rather, there is a restlessness simmering beneath the surface of Medusa even at its slowest, and combined with some relatively short song lengths (for death-doom, anyway – most tracks are between three and four minutes), it makes Medusa an initially challenging listen. Most songs don’t have the time to grow as might be expected in death-doom, yet neither do most of them have the immediacy of Draconian Times. The track listing is also a touch unusual – there is little consistency between tempos on adjacent songs, with slow tracks often leading in to relatively up-tempo ones, and many songs around the middle of the album have extended introductions or very abrupt ends that hinder Medusa‘s flow (for example, ‘From the Gallows’ seems to come to a very sudden end, and leads in to ‘The Longest Winter’ which, whilst a great song, has a very sparse opening 25 seconds). It means that Medusa is an album that takes several listens to fully appreciate, as it frequently wrong-foots the listener for small yet substantial reasons. 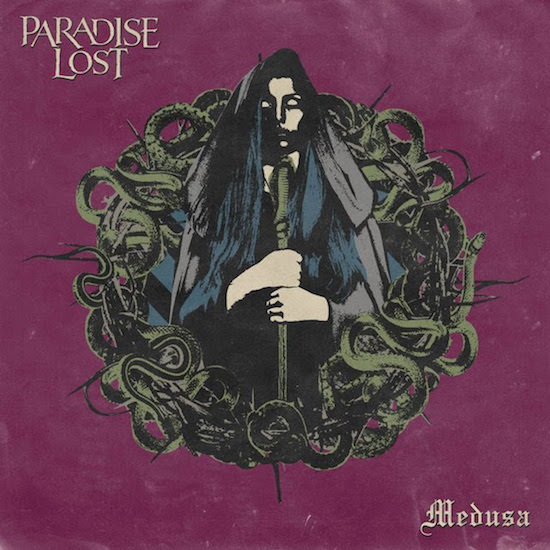 Given enough time, it becomes clear that Medusa provides further proof that Paradise Lost are a band who are still in fine form. There is a feeling that is a doubling-down on the sound of their current era rather than any grand evolution, and it does feel like an album aimed at fans of their recent records. Newcomers to the band are advised to begin with Gothic, Draconian Times, and The Plague Within; but existing fans are sure to enjoy Medusa, even if it will probably take a few listens to get a proper handle on the album. As good an album as it is, it’s difficult to shake the feeling that a little more polish with some of the introductions and endings, and a slightly altered track order, would vastly improve Medusa. Interview with Nick and Greg about One Second here. The Peaceville Three consists of Paradise Lost, Anathema, and My Dying Bride. Together, their early albums on Peaceville Records are considered instrumentally in shaping the sound and themes of death-doom. Since then they have veered away from that style to differing extents, such as the latter half of My Dying Bride’s Feel The Misery, or as Anathema have on their albums since A Fine Day To Exit.